One look at Jennifer Garner will convince you that her trainer, Simone De La Rue, knows how to work miracles. She’s helped whoop tons of stars, like Emmy Rossum and Rosie Huntington-Whiteley, into the best versions of themselves with her classic compound exercise routine. The secret ingredient in De La Rue’s guidance? It’s just one move, but it helps transform every part of the body: a “box squat to single-leg stand stability and one-arm overhead press.” The famous trainer swears by this technique with all of her celebrity clients for a few reasons. First of all, this move works muscles throughout your body, not just in your arms or legs. You’ll be able to target everything from your quads to your triceps with one simple move, which makes your workout routine easy and more effective than ever. Additionally, the move is still challenging, so you’ll break a sweat even though you’re only implementing one compound movement. Strength and conditioning specialists agree that the move’s ability to target multiple areas at once makes it extremely beneficial. As you tackle the box squat part of the movement, you’ll really target your lower half, including your core, glutes, and quads. You’ll also help strengthen the muscle around your hip, which translates to slimmer thighs and stronger hamstrings. Then, as you move into single-leg stand, you’ll keep your core tightened and work on your balance. This is a great way to target your spine and abs, and it’s way more enjoyable than doing a thousand crunches on the floor. Last but not least, you’ll push into the overhead portion that addresses your shoulders, biceps, and triceps. If you’re doing it right, you’ll certainly feel the burn as you enter this last step. Make sure to keep everything tight and to pay attention to how your body is reacting to the compound movement. You might wonder why this method of squatting is more effective than performing a regular, two-legged squat. Experts explain that using just one leg makes it more challenging to rely on your strongest muscles or dominant leg. You’ll be able to more accurately distribute the work, and you’ll even help make sure your body is balanced and equally strong throughout its lower half. Think about it this way: if you’re dominate on your right side, you probably know that your right leg is stronger than your left. However, by performing single-leg squats, you’ll make sure to train each leg equally and move away from muscle imbalance. If you rarely hit the gym, you might not want to start with De La Rue’s signature compound move. A better idea is to work your way up to this level of control by doing elevated lateral squats with knee lift and eventually moving into single-leg squats. Take your time learning to move on one leg and make sure you are fully prepared for the challenges of the compound move before you move into it fully. Start in squat position with left leg on the step and right leg on floor. Push up through left leg and lift right knee to side. Hold a moment and slowly lower back to start position. Repeat for desired number of reps and switch sides. Stand firmly with both feet together. 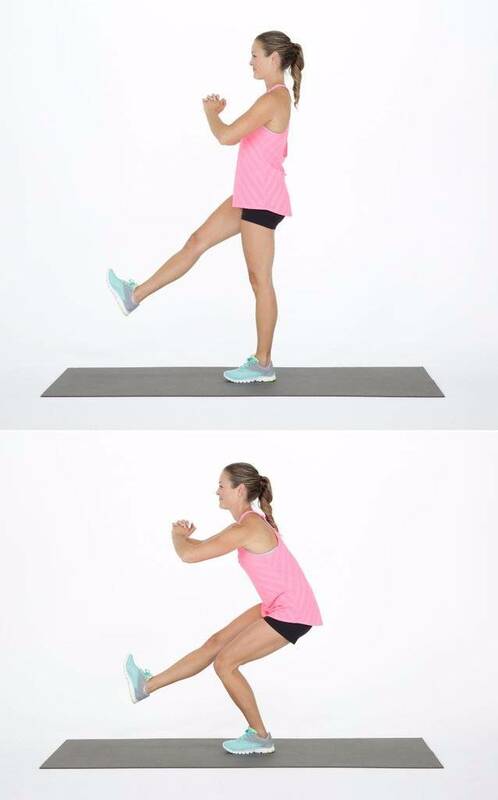 Put weight into your left leg and lift your right leg into the air. Keeping the leg lifted, bend the left knee into a squat. Then straighten the leg to complete one rep.
Keep your body aligned. Your ankles should be stacked underneath your knees, your knees under your hips, and your feet parallel. This will prevent you from experiencing joint pain or hurting your back. Remember to use your abs. By tightening your core while you complete the overhead press, you’ll decrease the risk of pain in your lower back and avoid overextending your spine. Do the move regularly. The more you practice it, the easier it will become. You’ll become stronger and stabler every time. If you’re looking for a new, challenging addition to your workout that’s praised by both celebrities and trainers, consider giving De La Rue’s compound movement a chance. Ease yourself into it, then work towards a more powerful, balanced body.